Are you an Ancient who participated in collegiate athletics? Please contact the Communications Office to share your information. Please email communications@missporters.org. Students listed played one or more years at the college level. This is not an all-inclusive list. The U.S. Rowing Women’s National Team has been training on Canal 54 in Fellsmere all week. It is the goal of the young women who made the trip to sunny Eastern Florida to represent the United States at the XXII Olympiad in Tokyo in 2020. Coco is quoted throughout the article. Alves is looking to reclaim her elite form from last season, when she was the country's only undefeated player to play all of her matches in one of the top three lineup slots. She earned a first-team All-Ivy selection after a perfect 13-0 campaign, including a 6-0 record against Ivy League opponents. Read the full article on Penn's website. Coco will be rowing for the U.S. NAtional Team in the Women's Eight. Read the announcement from U.S Rowing. Melissa Alves '14, ran the table unbeaten at Penn this season. The junior captain put together a perfect 13-0 record. Alves lost just four games the entire season. She will enter her senior season still having never lost an Ivy League match. A captain of both the women’s Soccer and basketball teams, Lexie Menard '12 is completing her final semester at Trinity College in Hartford, CT.
Victoria Cabral Named Scholar-Athlete of the Month. Victoria Cabral, a senior on the University of New Haven softball team, has been named the Scholar-Athlete of the Month for December. Read More. Ancients and former Porter's athletes Nora Weathers '12 and Shana Coffey '13 have continued their successful athletic careers at the college level. Haverford's Nora Weathers placed third overall (23:09.15) at the Dickinson Long (6k) Invitational in the field of 265 runners that competed in the long race. Read more. 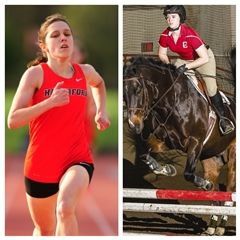 Shana Coffey '13, in her first college equestrian competition, competed in both flat and fences, won in both of her classes.